Buy or upgrade to an eligible Pay Monthly phone or plan and you’ll also get our EE Reward Card. You'll receive a prepaid Mastercard®, so you can spend your money on pretty much anything you like wherever Mastercard® is accepted. Go on, treat yourself. 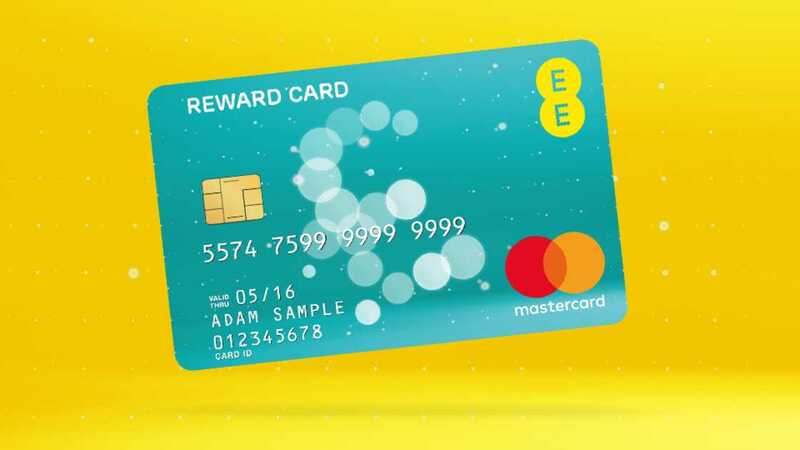 The EE Reward Card is issued by Blackhawk Network (UK) Ltd., pursuant to license by Mastercard International Incorporated. Why pick an EE SIM? It's included in all 4GEE Max plans and it's free for 3 months on other pay monthly phone or connected tablet plans. Now you can take your minutes, texts and data with you, to use anywhere in the EU. Perfect for sending selfies from the beach. Who is eligible for an EE Reward Card? Selected pay monthly and upgrading pay monthly customers who have received an SMS inviting them to register for an EE Reward card. How do I claim my EE Reward Card? - How long do I have to register for my EE Reward Card? You have up to 28 days from the date of purchase to register. - I have not received my registration confirmation email? If you haven't received your EE Reward registration confirmation email, please check your junk folder. If you still cannot find this email, please contact us on 0800 587 2296 (Calls to 0800 numbers are free of charge, even when calling from a mobile). - How long is the link to claim for my EE Reward Card valid for? After you have registered and once the claim window is open (28 days after purchase) you have a further 28 days to claim your card. - I have not received my claim confirmation email? If you haven't received your EE Reward claim confirmation email, please check your junk folder. If you still cannot find this email, please contact us on 0800 587 2296 (Calls to 0800 numbers are free of charge, even when calling from a mobile). - When will I receive my EE Reward Card? You'll receive your card in the post within 30 days of successfully completing the claims process. - I've not received my EE Reward Card? - Can my EE Reward Card be sent to a different address? No, your card can only be sent to the address used for registration. - Can my EE Reward Card be in the name of someone other than the account holder? No, the card can only be in the name of the account holder who registered for the EE Reward Card. - What address will my EE Reward Card be sent to? Your card will be sent to the address given at registration. - How long do I have to activate my EE Reward Card? Once received, you must activate the card within 6 months. If it is not activated within this time, you will no longer have access to the funds. - How do I activate my card? You’ll get an activation email from EE with instructions on how to activate the card online. Sometimes the email can end up in your junk mail, so check there as well. If you still can’t find the email, please visit www.purecard.com to request this activation instruction email again. You will need to make sure the card is activated within 6 months. If it is not activated within this time, you will no longer have access to the funds. The full Card User Terms are included in the legal bit below. Once the card has been activated funds are available to spend up to the expiry date stated on the front of the card. - What happens if I don’t spend the funds before the card expires? The funds are available up to the expiry date stated on the front of the card. Once the card expires, any remaining funds on the card will no longer be available and will revert to EE. - How long is my EE Reward Card valid for? Where can I use my EE Reward Card? - Where can I spend the money on my EE Reward Card? 1. Eligible customers will receive an SMS from EE within 5 days of purchasing an eligible pay monthly product or upgrading an existing pay monthly plan, confirming qualification and including an embedded link for customers to register their full details. If you have not received your reward registration SMS within 10 days, you should contact the EE Reward Team on 0800 587 2296*. 3. The amount of e-money available on this card will be dependent on the promotional period you qualified in. 4. Customers will have 28 days after the commencement of their Pay Monthly plan to register for their card, after this time the customer will no longer be eligible for the offer. 5. Once you’ve received the card, you will have 6 months from the date the card is issued to activate your card. After 6 months, you will no longer be able to activate the card and will no longer be eligible to take part in the offer. 6. Should you cancel or exchange your EE plan within 28 days, you will no longer be eligible for this offer and no card will be sent out to you. You will receive confirmation of this should it occur. 7. Your card will be sent out via first class post, in the name of and to the address used when registering for the card. You will be advised of your PIN upon activating your card. 9. The balance on your card will be available for you to spend from the date you have activated the card until the card expires, date shown on the front of the card. 12. Fulfilment of the reward will be managed by Grass Roots Limited on behalf of EE. If the reward is not received within 30 days of claiming, then you should contact our dedicated Customer Service team on 0344 800 6435* or email info@cardholdersvs.com. 13. The EE Reward Card Mastercard® is issued by Blackhawk Network (UK) Ltd​, an Electronic Money Institution authorised in the UK by the FCA with Firm Reference number 900023; pursuant to license from Mastercard International​. Mastercard® is a registered trademark of Mastercard International Incorporated. Blackhawk Network (UK) Ltd’s company registration number is 05802971 and its registered office is at 40 Bernard Street, London, WC1N 1LE. Calls to 0800 numbers are free from your Pay Monthly handset. Calls to 03 numbers are included in your EE Pay Monthly minutes allowance. For out of allowance charges, please see your price plan terms.